One of the other perks we were offered on this ship because we are on such a long cruise is our choice of up to 3 daily newspapers. We expected this to be a couple of pages of the main articles, but, to our surprise, we received a complete copy of the Washington Post last night. It is printed on 14x18 paper, so the print is a little smaller than the regular paper and it's a lot heavier. They must have a high speed printer on board and a deal with various newspapers around the world to get these electronically, right down to the ads. We had another easy morning today. The ship didn't dock in Napier until 11am and our tour was scheduled for 12:15pm. 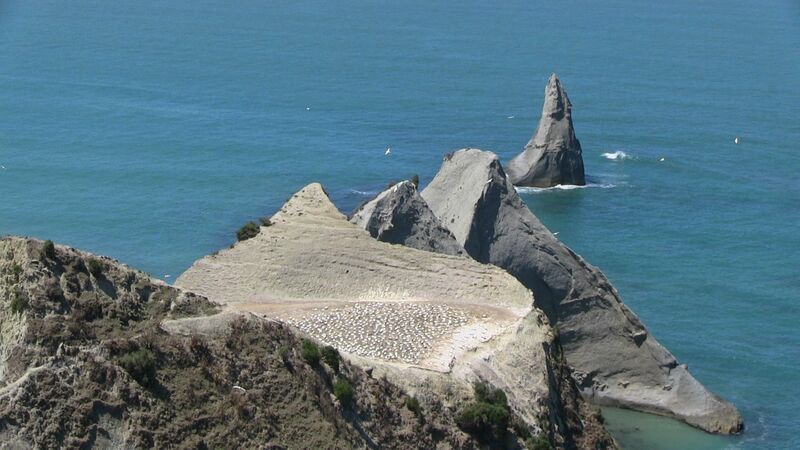 Today's tour was called "Cape Kidnappers and Gannet Safari." This began with a ride in a four-wheel drive bus down a 3 mile narrow winding road along very rugged terrain. The scenery was fantastic. This road was the access road through a sheep farm, golf course and resort to Cape Kidnappers. The land is owned by American financier Julian Robertson and it seems he has earned the admiration of most of the people of New Zealand. He has provided jobs for locals and rid his farm of most of the predators that attack the endangered Kiwi birds. The farm is now being used as a new protective habitat for the Kiwi birds. The road was narrow and steep. The sheep grazing on the hills didn't seem to mind. The ride was worth it however. 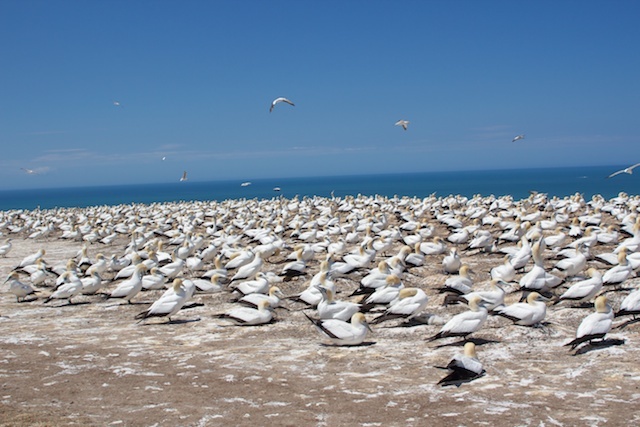 At the end was a huge colony of gannets. 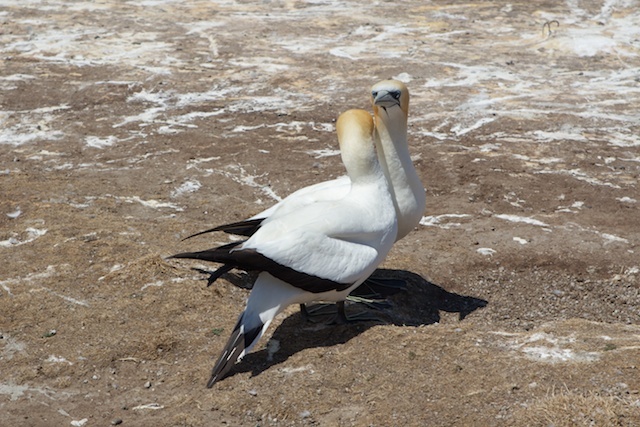 Many of them were still sitting on eggs and there were also a few recently hatched gannet chicks. It was a fascinating sight. We saw some birds protecting and feeding their chicks, while others appeared to be engaged in courting dances. Our guide said we were only seeing about a third of the colony because the parent birds take turns going out to get fish to feed the chicks. On the way back to the ship, the driver took us on a short tour of the town of Napier. This town was destroyed by fire in the 1930s and then totally rebuilt in the Art Deco style that was popular at the time. The locals are very proud of the architecture. Back at the ship, 5:30pm was block party time. Everyone was invited to bring a glass from their room and go out into the halls to meet their neighbors. The crew brought around wine and hors d'oeuvres. Everyone in the staterooms in our section came out. The captain and officers came through to shake everyone's hand. We are now on first name basis with all our neighbors.